Effective States » Cape Town Live Blog: Day One – What’s the deal with political settlements? Cape Town Live Blog: Day One – What’s the deal with political settlements? Getting academics to agree on something is like herding cats; but cats too can sometimes surprise you. Day 1 of the ESID Midterm Workshop in Cape Town has highlighted many of the differences that we have in how much we get out of our core analytical framework; amazingly, though, it has also managed to unite us all on the single purpose – however Quixotic – of refining that framework and making it truly useable and able to generate policy-relevant knowledge. But is it really a useful analytical framework? Much of our discussion across today’s sessions has emphasised how “political settlement” is a problematic conceptual tool: it is conceptually nebulous; it is hard to measure (is it even observable? ); it presumes equilibrium instead of change; it has an unclear level of analysis (country or sector? ); and prescriptively it may lead to simple selectivity (“in context X do A, in context Y do B”), which is an inherently conservative approach to policy. But in the absence of a persuasive alternative, it may well be the best concept that we have at the moment: we “just” have to solve our explanatory, predictive and prescriptive concerns. Luckily a variety of ESID projects are putting the framework to the test. During breakout sessions in the afternoons, three separate groups have discussed the usefulness of the political settlements model for specific policy and research domains. 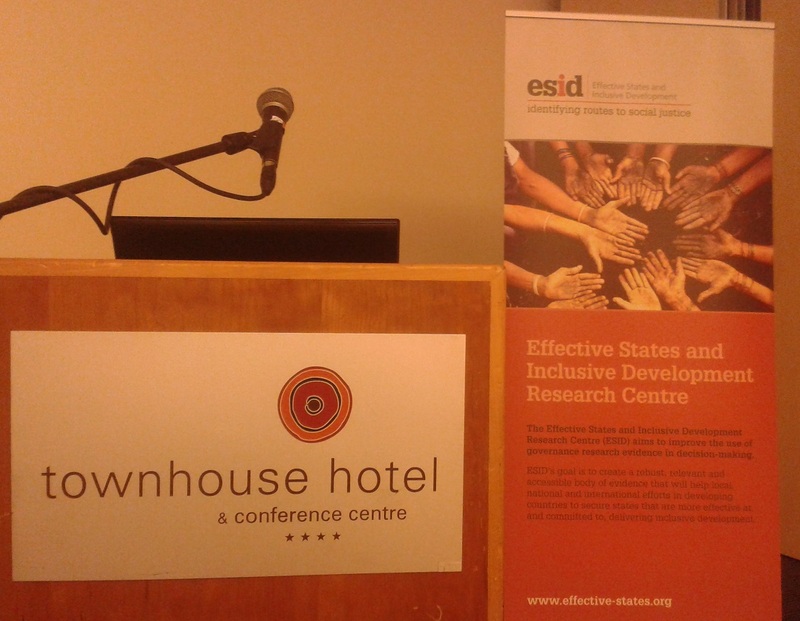 I attended the session on ESID’s programme 5 on transnational politics. We reached a consensus (of sorts) that the idea of national political settlement does not leave enough analytical room for either transnational dynamics or non-elite actors: for instance, the policy achievements of transnational pro-poor activists like Slum Dwellers International perfectly demonstrate these shortcomings. On Wednesday all groups will report on their experiences of the political settlements framework; I won’t spoil now what our group will say then. But the big challenge for us is to be analytically constructive: if something is missing, what can be added? And if something is inadequate, what is the alternative? The other two big issues of the day – which will persist during the rest of the workshop – have been the need to ensure effective uptake and dissemination of our findings, and what this requires in terms of building the capacity of our researchers (especially our country partners). As one of our lead researchers put it, the recipe for impactful research can be summarised by four R’s: Relevance, Relationships, Rigour and Repetition. On Tuesday and Wednesday we will devote some sessions specifically to the challenges and opportunities of communication, discussing practical ways to enhance our partners’ and researchers’ voices in public policy debates. Check in tomorrow for more live blogging on the analytical comings and goings in Cape Town. In the meantime, you can also follow the tweets @BrooksPoverty, #statesthatwork.